With these famous words from his epic ground-breaking novel, H. G. Wells prefaced the coming invasion of Earth by the Martians. There is a modern parallel happening right now, in which the Martians are in fact Missourians and, slowly but surely they are drawing their plans against the crumbling Persing administration in Sunbury. A letter was received by City Hall on Monday 8th July. Any alert observer at the City meeting held that night would have noticed the general demeanor at the front table – the distinct lack of bonhomie, the nervousness and, especially, the long faces. The City Administration seemed somehow distant, as if weighed down with the responsibilities and problems of government. Not The Item has obtained a copy of this letter, addressed to the Mayor and members of the City Council, as well as to the Department of Environmental Protection in Williamsport. In it, Kansas City Missouri-based attorney Charles Speer refers to clients who have been affected by the City’s actions. He refers to concerns about health rising from the situation still existing at the former Celotex site, about early morning truck noise, about excessive volumes of dust which are causing breathing problems for local residents, and producing dust and dirt in homes near the site. He was concerned that the dust raised by these trucks could cause extreme health risks and irreversible health deterioration, or over time, death, for those, including his clients, forced to breathe dust generated on the site. 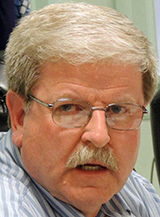 He goes on to quote a number of city codes of which, he claims, Moran Industries are in on-going violation – violations concerning lack of stormwater management resulting in flooding of basements, city streets, parking lots and underpasses, others to do with unregulated land subdivision as well as dust production. The City Administration, he says, were made aware of these violations over a year ago but, as of now, they have not been addressed. Mr. Speer advises Persing that his administration itself is in violation of their duties and obligations to enforce city codes, and that their refusal to do so endangers the health, welfare, emotional well-being and the enjoyment and use of his clients’ properties because of dust, flooding and excessive noise. He instructs the Persing administration to enforce the city codes immediately to correct all the above-mentioned code violations, as well as all other code violations, such as those covering burning and air pollution, in order to avoid litigation. It would appear to us that the ante has just been upped – considerably. What is Mayor Persing going to do now? Is he going to continue to jeopardize the health and welfare of our citizens as well as risk expensive litigation against the City, or is he, for once, going to do what he was elected to do – protect our city and our citizens, enforce our city codes and, at long last, tackle the menacing Trojan horse of Moran Industries. Mayor Persing heads towards litigation.